For this edition of Behind the Brand we caught up with Alex Putici, owner and operator of Calgary’s best coworking space, Work Nicer, which also happens to be the office space ELEVATE works out of, what a coincidence right?! I digress, ELEVATE created the logo for Work Nicer and is helping bring to life its chosen brand identity. 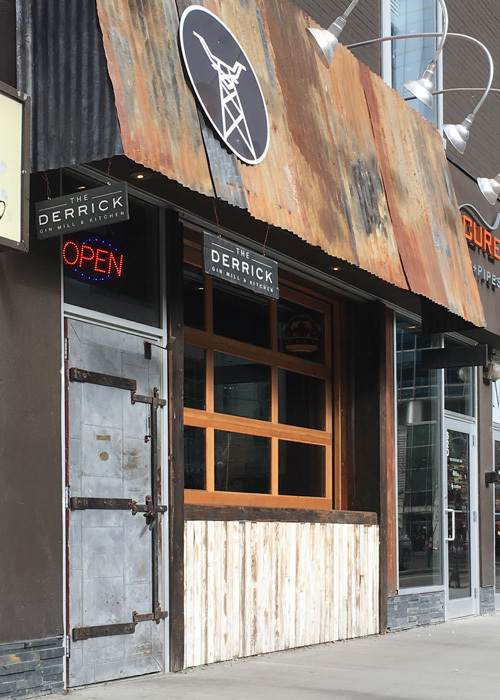 As an excuse to venture outside of the office for a hot second, we took Alex for lunch at his favorite restaurant and bar, The Derrick. Work Nicer is a progressive and collaborative space making efforts to celebrate and drive the entrepreneurial spirit. 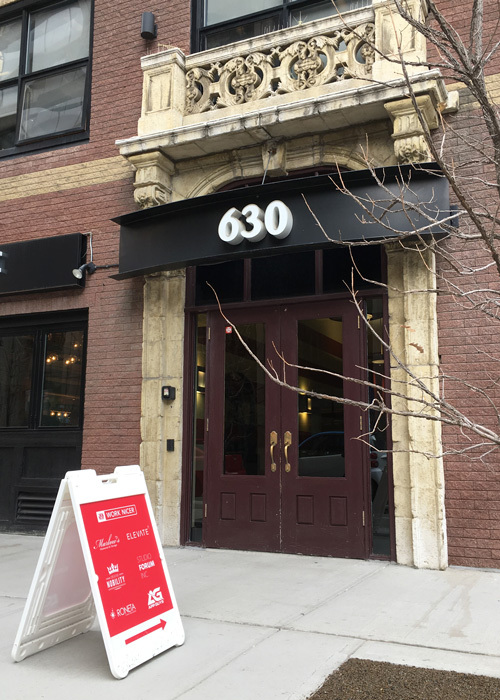 For those of you unfamiliar with Work Nicer it is a coworking space located on the trendy Stephen Ave in Calgary, Alberta. Coworking is a growing trend in the Calgary economic scene. Work Nicer is a progressive and collaborative space making efforts to celebrate and drive the entrepreneurial spirit within Calgary’s small business community. Work Nicer replaces the water cooler small talk for actual conversations worthy of possible business ventures and opportunities. Why go to a networking event when you can network around the espresso machine. I digress, back to the Derrick. 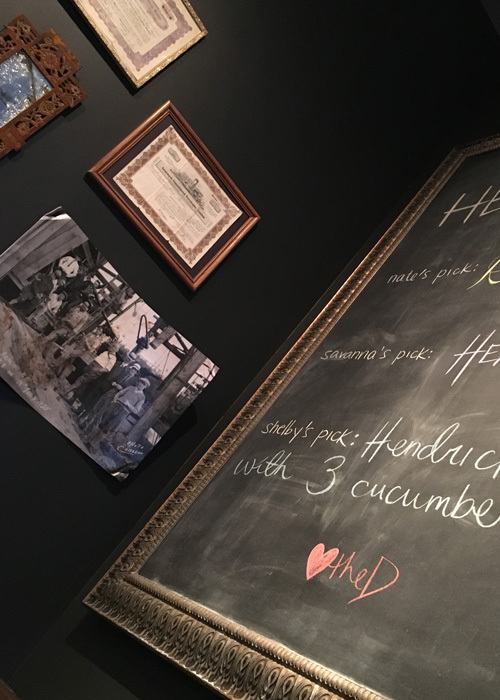 We’re sitting in Alex’s favorite booth, perusing the menu, feeling famished and of course a little thirsty, you can’t help but feel immersed within the ambience of the Derrick. Everything from the dark moody decor, the televisions playing classic movies and the large buffalo head staring at you from out of the back bar. Looking around we had to ask Alex why he loved the Derrick as much as he did. “What’s not to like,” Alex replied with a smile. 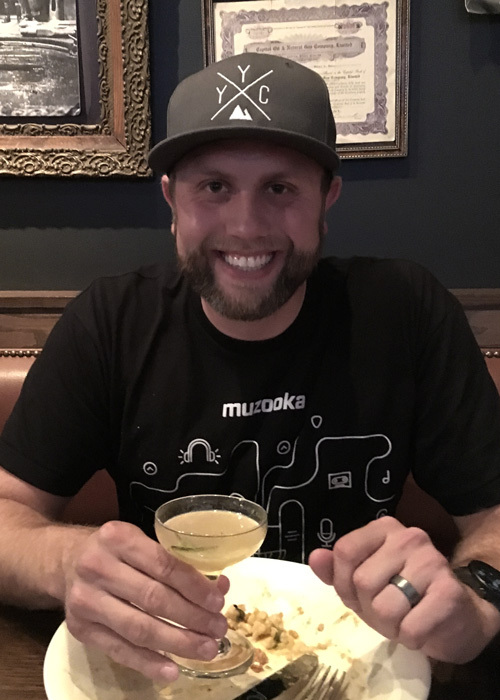 If you’ve met Alex, you’ll know right away he supports local businesses, and will do pretty much everything in his power to put the word out and drive business to local entrepreneurs. The Derrick is one of those companies Alex’s loves to support. The Derrick staff and management are well versed in cocktails, food menu’s, prep, and even make their own special tonic, and honey. I mean, does it get much better than that?! Back to the brand. Work Nicer, similar to the Derrick, is all about local. Work Nicer is collaborative, progressive and fuels the passion of Calgary’s entrepreneurial community. It’s working differently, working smarter and of course as the name implies, working nicer. As Alex put it so technically he wanted to come up with a name that encompassed all the stuff. “All the stuff” meaning Alex wanted the brand name Work Nicer to encompass all of the moving parts of the business. Everything from the infamous ‘Drink Nicer’ on Friday’s at 4:00 pm, to Work Nicer’s corporate culture. Working in a coworking space means more than just how the members function in day to day happenings. Work Nicer brings together the many facets and aspects of a business and what the perception of that business showcases. The brand of Work Nicer looks to encompass a different way of working and being part of an entrepreneurial community that brings forth more than just a place everyone commonly works out of. Ok so here’s how we came in. It was ELEVATE’s goal to translate Work Nicer’s culture into a recognizable and memorable brand. 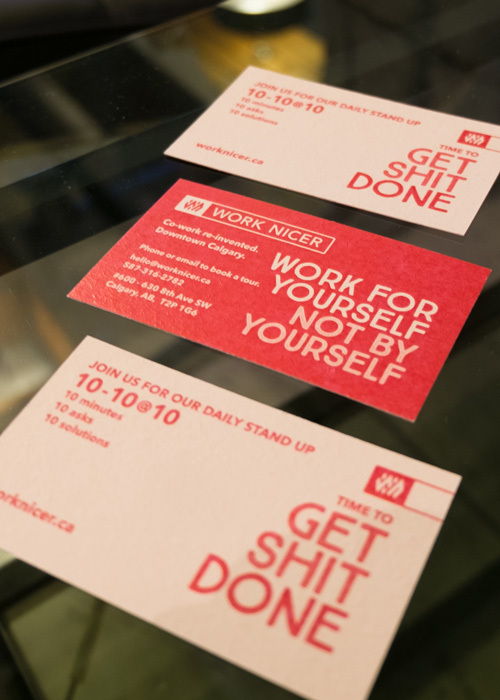 We wanted to incorporate the words network, growth and development into the meaning of Work Nicer’s brand. Mixing Alex’s personality, his vision and personal style, Work Nicer started to take on a life of its own.  Although the name came pretty quickly, we knew it wasn’t the name that was subject to change, it was the brand that was going to be continually evolving. Work Nicer’s brand was set up to evolve. The Work Nicer community and coworking space was constantly being filled with new members and new companies, therefore the brand wanted to entertain that idea of evolution and involvement. So this is what we initially came up with. It’s always exciting to me to see the evolution of a brand and how the beginning ideas and thoughts grow during the design process. I mean it’s all part of the design and brand journey, but it is still spectacular to see the growth and evolution, I love it! 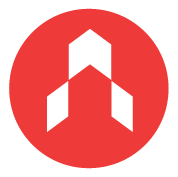 During the final stages of logo and brand development, the logo was modified to look more like a “W” and an “N” and the colour red was used to imply strength, energy and life – cool right! Alex is the owner and founder of Work Nicer. As it is a community of invested members, Alex wanted to make sure that everyone had a chance to give feedback on the look and feel of the brand. This is great when generating ideas, but does come with challenges. Alex and Corey were on the MS bike tour and received a call from Jon, a partner in Fitness on the Go, another Work Nicer member. He didn’t understand the logo direction and wanted the “W” and “N” more clear. Alex’s wife, Danielle described it as an 80’s tribal tattoo! At Elevate all opinions and idea are welcome, so we explained our rational to Jon and Danielle. With a few modifications to the shape, we won them over. It is important to us to be open to new ideas and criticism. The rationale behind Work Nicer’s logo is the idea of tying people together, a group that binds everybody together around the Work Nicer nucleus. The line around the wordmark and logo keeps the word mark and logo together and allows the mark to be used in a variety of applications. Lastly the text is a simple, open and honest font. The corners of the letters are rounded to soften the shapes and make the text friendlier and more welcoming. Since ELEVATE is in the Work Nicer space there is close communication with Alex on an almost daily basis, as a result, the brand is evolving organically. This allows us to have a fuller and closer understanding of what Alex is thinking, what he likes and doesn’t like. Since we are a part of the Work Nicer community there has also been input and support from other members such as Rebecca from Creative Nobility and Dario from Octopus and Son. This “brand date”, as we like to call it, for ELEVATE’s Behind the Brand blog was met with tasty cocktails and moody ambience from The Derrick, plus the always pleasant company with Alex Putici owner and operator of Calgary’s best coworking space, Work Nicer. We hope you enjoyed the blog! Thanks to the awesome Kathleen Smiley for this edition of Behind the Brand. You can find more of her writing at her blog, ‘That Awkward Dating Moment’. Where she discusses tales and commentary of dating and lifestyle stories. Follow Kathleen on Instagram @k.smiles442! Listen to our new Podcast, Start Now. Our guest is Alex Putici from Work Nicer!